One of the truly unique advantages of Pepscan’s Precision Epitope Mapping is that once a peptide array for a certain protein target has been made, it can be used multiple (up to 100) times. This feature makes Precision Epitope Mapping a very cost-efficient approach for a multitude of applications in the drug development process, from early characterization and selection of lead antibodies to manufacturing. Demonstrating epitope consistency in the development of biosimilars (case example 4). The importance of CLIPS Precision epitope mapping for IP purposes is greatly illustrated by the landmark case between BiogenIdec, Inc. and GlaxoSmithKline LLC, in which parties contested claims of BiogenIdec’s US patent 768612 concerning the use of antibodies to CD20 for treating chronic lymphocytic lymphoma. It was initially believed that only one large loop of the CD20 receptor was exposed on the surface of cancerous B cells, and therefore, that there was only one suitable target for the anti-CD20 antibody. However, Pepscan’s comparative Precision Epitope mapping studies had revealed a unique discontinuous epitope for ofatumumab, different from the epitope of rituximab. It showed that in contrast with rituximab, ofatumumab also binds to a previously unknown second small loop of the CD20 receptor. The US Court of Appeals for the Federal Circuit (BiogenIdec, Inc. vs GlaxoSmithKline LLC, 2013) followed the position that ofatumumab binds to a different epitope than does rtuximab. Consequently, the court decided that ofatumumab did not infringe US patent 768612. Precision Epitope Mapping revealed distinctly different binding sites for rituximab and ofatumumab on CD20 and demonstrated that ofatumumab uses a unique discontinuous binding site. (Ref. Teeling et al. J. Immunol. 2006; 177:362-371). It also contributed to the understanding of the mechanism of action and offered a valuable opportunity for marketing differentiation. Also obtaining new IP based on epitope mapping has proven successful for many companies. To obtain patent protection for a new antibody against a known target one must find a way beyond merely specifying the target to define its antibody product. Specifying a therapeutic antibody by its target epitope has proven to be a successful approach. (ref: Sandercock & Storz, 2012). Therapeutic CD20 antibodies are classiﬁed as either type I or II based on different mechanisms of killing malignant B cells. 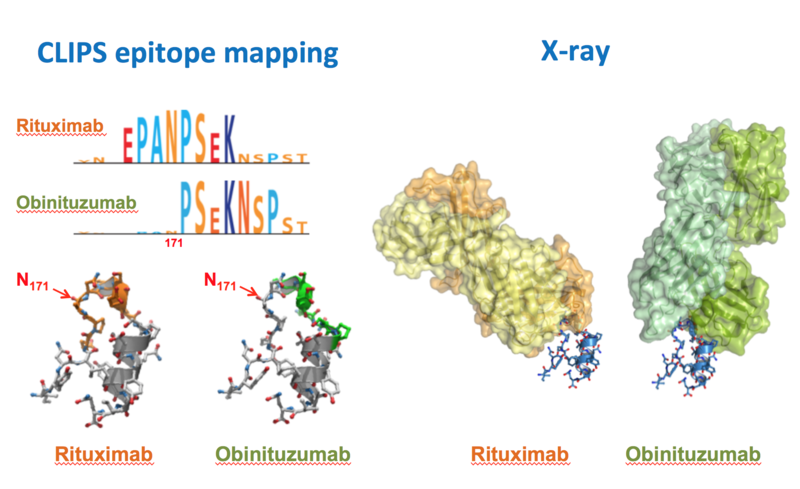 To reveal the molecular basis of this distinction, we ﬁne-mapped for Roche the epitopes recognized by rituximab (Type I) and their novel antibody obinutuzumab (Type II). A CLIPS peptide library derived from CD20 was synthesized on solid support and screened with rituximab or obinutuzumab with single-residue precision. 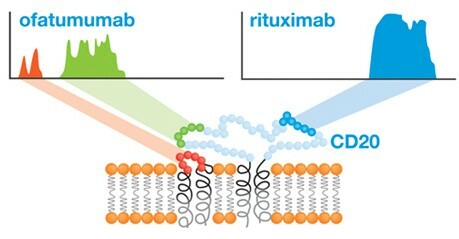 This revealed that Asn-171, crucial for the binding of rituximab to CD-20, was not critical for obiunutuzumab, pointing to a shift in binding orientation between the two antibodies. This shift was later confirmed by X-ray crystallography. CLIPS epitope mapping identified a novel epitope on CD20. This altered functionality can be developed into a novel cancer therapy for patients resistant to rituximab. The absence of requirement for Asn-171 allowed the creation of new IP for obinutuzumab (GA-101), of key importance for the life cycle prolongation of Roche’s CD20 franchise. Obinutuzumab received FDA breakthrough designation as well as accelerated review and was launched by Roche in 2014. When administrated in human’s antibodies of non-human origin induce an immune response. Therefore, binding regions of non-human Abs are often engineered in a process known as humanization. Care must be taken that the specificity is not changed. During drug development it is essential to be able to select humanized variants which preserve the specificity of the parental antibody. 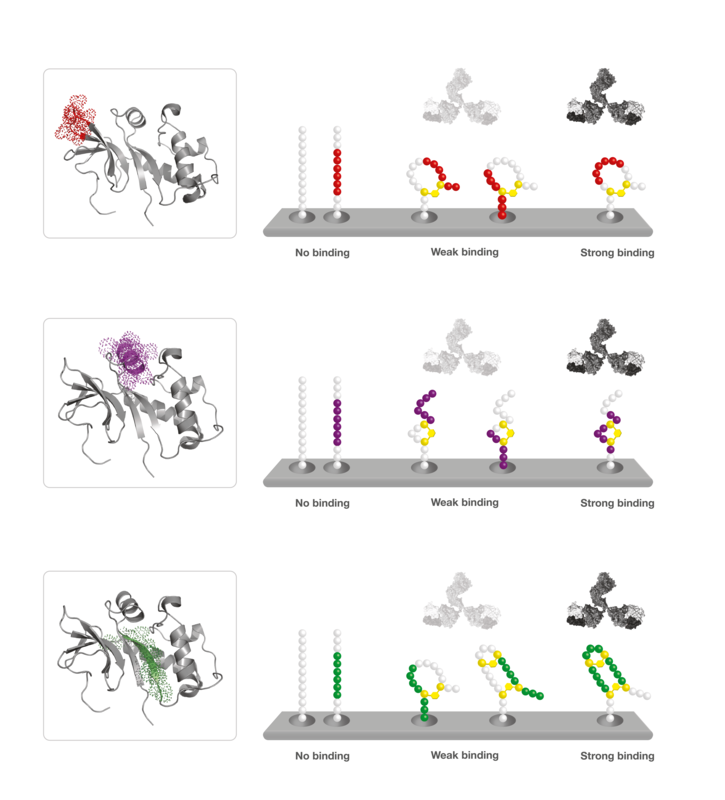 Initially, a comprehensive library of CLIPS peptides was used to identify the epitope of the parental antibody and pinpoint residues essential for the binding (left panel in figure below). Humanized variants “A”, “B” and “C”, obtained by CDR grafting in different acceptor frameworks were similarly tested with this peptide library. The scatter plot illustrates that antibody “A” binds the same set of peptides as the parental antibody does and, thus, has the same specificity. Humanized variant “C” fails to reproduce the binding pattern of the parental antibody, whereas variant “B” remains closely related to the parental antibody, but somewhat differently binds the target molecule. These differences may arise from alterations of fine specificities of “B” and “C” when compared with that of the parental antibody. Precision Epitope Mapping allows precise and detailed epitope characterization for panels of antibodies, as the re-usability of peptide arrays allows testing and comparing binding of up to 100 antibodies on one array. In the present case, Pepscan peptide libraries served to compare epitopes for various humanized variants of an antibody and identify the antibody in which the epitope specificity was preserved. Left panel: schematic drawing of the antibody-antigen interaction. Right panel: scatter plots highlighting differences (data points in top left and bottom right corners) and similarities (data points on the diagonal) in peptide binding between the murine parental antibody (y axis) with humanized variants “A”, “B” and “C” (x axis) in pair-wise fashion. Below each scatter plot is the corresponding schematic drawing of the antibody-antigen interaction based on the results obtained with CLIPS peptides. Epitope region is denoted as sequence R₁R₂R₃R₄R₅R₆R₇. Single substitutions of residues in red or green affect the binding to larger or lesser degree. Questions of comparison of biotherapeutic candidates, batch-to-batch control of the lead antibody production and assessments of the off-target binding are often efficiently addressed by means of Precision Epitope Mapping. The recent increase in development of new biosimilars has resulted in a new application of comparative epitope mapping to demonstrate epitope consistency at the early stage of development and selection of biosimilars. Due to the unique reusability of Pepscan peptide arrays it is possible use the same array for numerous tests throughout the time of a project (arrays can be stored up to several years). 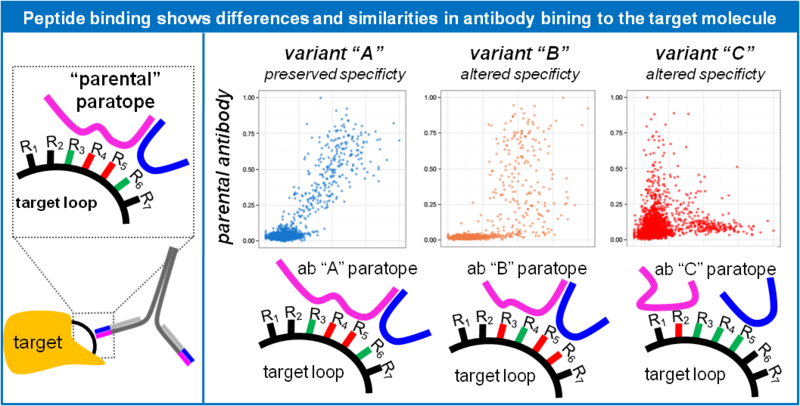 Two illustrative examples of a comparative mapping performed for two antibodies in development versus the originator reference antibody are shown below. An alternative so called “butterfly plot” representation is shown as the example. One of the antibodies (left panel in green) was confirmed to be similar as its binding profile perfectly coincides with that of the reference antibody. On the contrary, the other antibody (right panel in red) displays a strikingly different binding pattern, suggesting that this antibody significantly differs from the reference antibody. Butterfly plot: Comparison between a commercial reference antibody (blue) and two antibody candidates under testing (green and red) with precision epitope mapping analysis showing an identical binding profile for the green candidate but not for the red candidate. Precision Epitope Mapping: how does it work? The target linear sequence is converted into a library of all overlapping linear peptides directly synthesized on a proprietary solid support called “mini-card”. Binding of antibodies is quantified using an automated ELISA-type read-out. Constructs containing right amino acid sequence in the correct conformation best bind the antibody. However, the majority of biomolecules of therapeutic interest recognize conformational or discontinuous epitopes, which cannot be reliably (if at all) addressed by means of linear epitope mapping. For many antibodies the primary sequence of amino acids is not sufficient for binding and additional 3D structure features are needed. This is why Pepscan perfected its platform to enable systematic mapping of conformational and discontinuous epitopes. One example is creating simple secondary structure mimics by applying different CLIPS scaffolds allowing to thermodynamically favour a limited series of peptide conformations. In such a manner CLIPS peptide libraries can mimic secondary structure elements, such as loops, α-helixes and β-strands. A schematic representation of this approach is drawn in the figure below, where all three secondary structure elements present in the target’s 3D structure are mimicked using various CLIPS chemistry strategies. Subsequently the binding of the antibody to each construct of the entire library is determined, using an automated ELISA-type read-out. This identifies those CLIPS-constructs that best mimic the interaction site of interest. A schematic representation of the approach is presented in the figure below. Designed constructs containing both parts of the interaction site in the correct orientation are bound with the highest affinity by the test antibody, which is detected and quantified. Constructs representing theincomplete epitope bind the antibody with much lower affinity, whereas constructs not containing (parts of) the epitope are not bound by the antibody at all. Bioinformatic statistics-based analysis of the combined binding data is used to define the sequence and conformation of epitopes in detail. CLIPS Precision Epitope Mapping also allows detecting of conformational, discontinuous, and complex epitopes involving dimeric or multimeric protein complexes. The Precision Epitope Mapping is based on Pepscan’s proprietary platform for making microarrays containing large libraries of surface-immobilized linear, secondary and tertiary structure CLIPS-based epitope mimics. Using high-throughput parallel microarray synthesis technology, a full library of linear, conformational and discontinuous epitope mimics, is synthesized on a proprietary surface with a polymeric graft optimized for low non-specific binding and high peptide construct loading resulting in high sensitivity of the Precision Epitope Mapping technology. Via Pepscan’s patented CLIPS technology these peptides are structurally fixed into defined three-dimensional structures. This enables mimicking even the most complex binding sites. The CLIPS technology is now routinely used to create peptide libraries of single- or double- looped structures, as well as sheet- and helix-like folds. Pepscan provides Precision Epitope Mapping as a complete end-to-end service. Supported by the expertise of our scientific team this allows each customer to fully benefit from all options the Precision Epitope Mapping technology offers. A project usually starts with a discussion with the customer to define the project objectives. Before a project is discussed in detail, upon request, Pepscan is willing to sign a Confidentiality Disclosure Agreement (CDA) to assure absolute confidentiality. Sequence of target protein in FASTA format or UniProt ID. Minimal material consumption: 20 μg antibody or 20 μl polyclonal serum. Design and synthesis of target-derived peptide arrays on re-usable "Minicards"
The timeline of a project starts with the design of the peptide arrays based on the sequence of target protein provided by the customer. Depending on the size of the target protein and the complexity of the project the synthesis of target-derived peptide arrays usually takes around 4 – 6 weeks. We usually ask to ship the sample(s) within this period. The duration of the screening depends on the number of samples to be tested, followed by 1-2 weeks for data analysis, evaluation and preparation of the report. In most cases a project is completed within 3 months, although more time may be needed for large series of samples.